Just a week after announcing that it had commenced gold production from the 5.1 million ounce Matilda gold project, Blackham Resources (ASX: BLK) has informed the market that the first gold pour has been completed, a significant milestone given the funding deal with Orion Mine Finance was only struck 16 months ago. The group is now focusing on the ramp up and optimisation of the Wiluna gold plant with management indicating that both throughput and recovery are now underway with a view to maximising plant performance. In tandem with these developments has been a retracement in the group’s share price, and as broker reports suggest this may represent a buying opportunity. From an operational perspective, mining from the open pits and underground has contributed to stockpiles greater than five weeks mill feed, positioning the group well to move to commercial production. Of course it is not there yet, so if considering this stock for your portfolio take all public information into account and seek professional financial advice. Looking at the broader picture, having quickly progressed to Stage I gold production, management is now fast tracking the second stage expansion study which aims to increase annual production to a range between 175,000 ounces to 230,000 ounces. While these developments have been well flagged by management, there was an interesting note released by Brett McKay from Petra Capital at the start of the month as he initiated coverage on the stock with a buy recommendation and a target price of $1.10. This implies a 47% premium to Wednesday morning’s opening price of 75 cents. 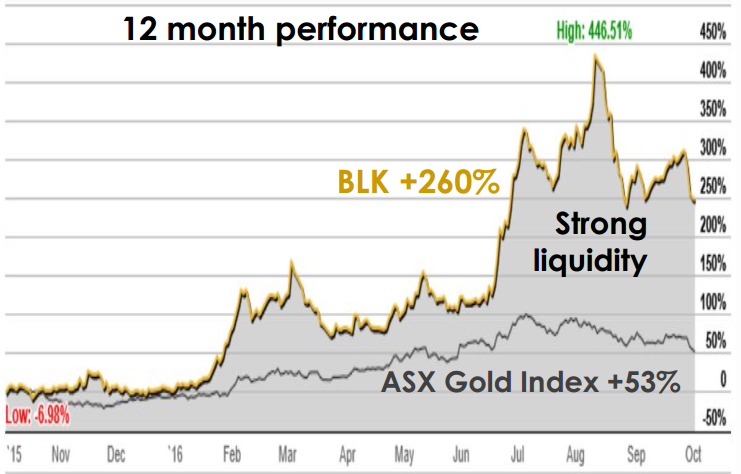 BLK’s shares have come off substantially since hitting a high of $1.18 in mid-August, arguably driven by a mix of profit-taking and more recently, negative sentiment towards the gold sector. However, it is worth noting that the company’s share price over the last three months is in sync with movements in the S&P/ASX All Ordinaries gold index. This raises the question as to whether the company should be trading in line or at a premium to the index. As indicated by the 12 month share price performance against the gold index, investors have been attributing a significant premium based on the group’s promising outlook. This raises the question as to whether the stock has dropped off the radar because of broader negative sentiment towards the sector when the focus should be on its compelling medium to long-term outlook. Given BLK’s production growth profile is superior to many of its peers it could be argued that a premium is appropriate. Certainly this is reflected in the consensus 12 month price target of $1.15, representing a slight premium to Petra Capital’s target. While the pullback in the commodity price could see some downward adjustments in broker price targets, this remains to be seen. Petra’s earnings projections support its price target, particularly in fiscal 2018 when it expects production to exceed 100,000 ounces. The broker is forecasting the company to generate a net profit of $50 million in fiscal 2018, representing earnings per share of 16 cents. This implies a PE multiple of less than five relative to this morning’s opening price. More importantly though, it validates Petra’s price target which implies a PE multiple of 6.9. Even though McKay hasn’t factored in changes in earnings from an updated reserve and mine plan which is expected to underpinned and expansion study in early 2017 he made some interesting comments on the potential impact of a change development plan. 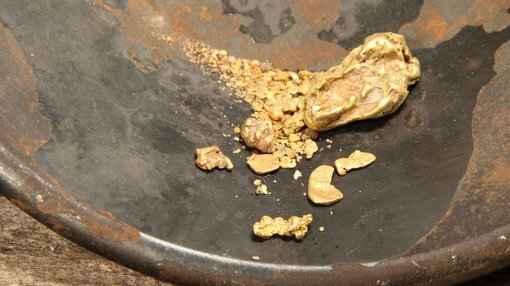 Noting that ongoing drilling and studies are aiming to increase the mine life to around 6 to 7 years McKay said that the expanded project with four years of mine life adds 11 cents per share with each additional year of mine life adding a further 25 cents per share to the net present value. McKay said, “The addition of extra milling capacity would allow the processing of both oxide and sulphide ore at the same time, thus lifting throughput to up to 2.7 million tonnes per annum for production of circa 200,000 ounces per annum over a shorter initial mine life of four years”. 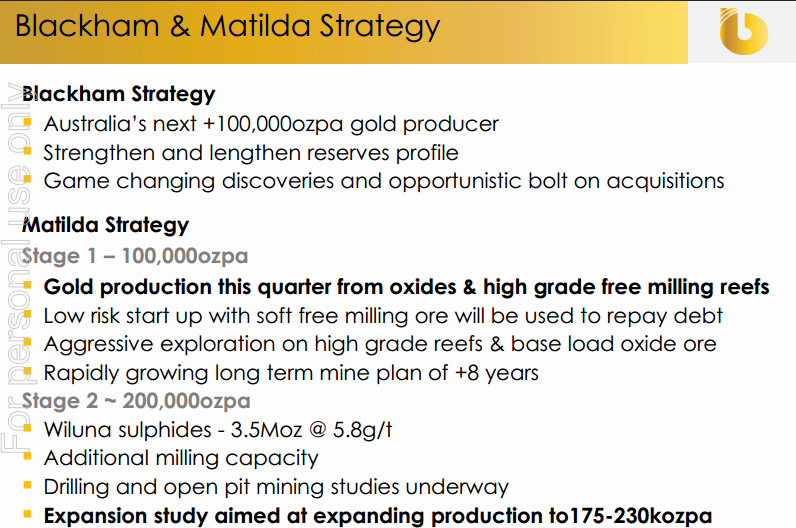 Is Blackham Resources turning the gold corner?